Pooja and rituals at Perne Shree Muchilot Bhagavathi Kshetra are occasional and performed on the special day of every month and on festivals. Daily pooja is not offered here. 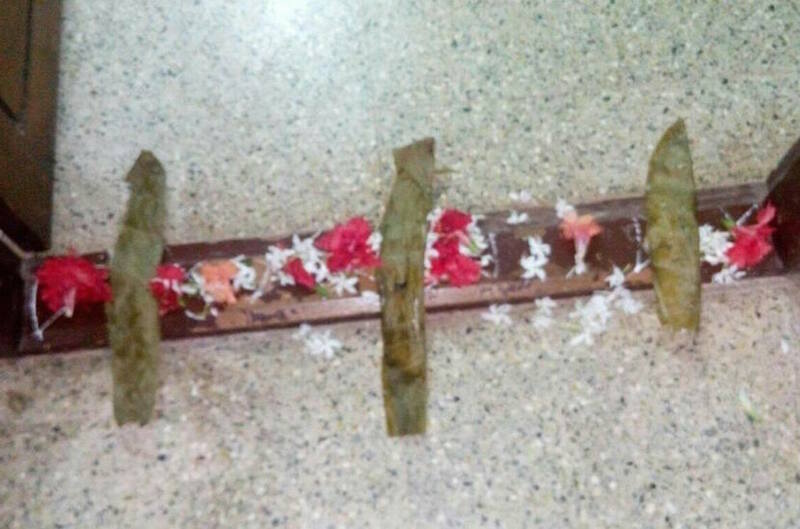 Rituals are performed through prayers using flowers, fruits, rice and appam. Every morning temple surroundings are cleaned (Adichu Teli) and evening "Deepa" is lit by the priest (Naltyar). Beginning of every month (Sankramana) and on first Tuesday, Pooja is offered to the god by the priest. Festival season begins at the last Sankramana of Karkataka (Karkhidakam) month. Temple is opened on this day and "Hostilu" pooja is performed. Here threshold of the shrine is cleaned and pooja is offered by dropping flowers over it. This practice is repeated for 30 days of Simha (Chingam) month. "Hostilu" pooja is also performed at every household of Vaniya community. The festival of light, Chevva Vilak is carried out on the 28th day of "Simha "month. The Komaras, Nalthyars (Andithiriyan), Karnavas, Chettiyan, Randadk come together on this day along with people from the community. On the day, morning at Shree Kshetra Ananathapura, "Kalasha Snanam" is performed to Komaras and Nalthyars. After offering "Karthika pooja" at Ananthapura temple, Bhandaram is brought from Ananathapuram to Perne in the evening. "Appa Prasadam" preparation is initiated by Nalthyars then followed by youngsters of the community. Later with the permission of "Padipura", pooja is performed. At last Acchanamar's "Kulichu Nikkal" and "Darshanam" is experienced. The traditional harvest festival is called Puthari. ‘Puthari’ means new paddy. It's celebrated on the day as scheduled on simha maasa Chevva Vilak festival. The annual festival of bringing in new crops to the temple is celebrated at Perne with traditional gaiety and religious fervor. Appam is prepared from the new Rice and it is offered to good. After that, all the gatherings will be served with food. 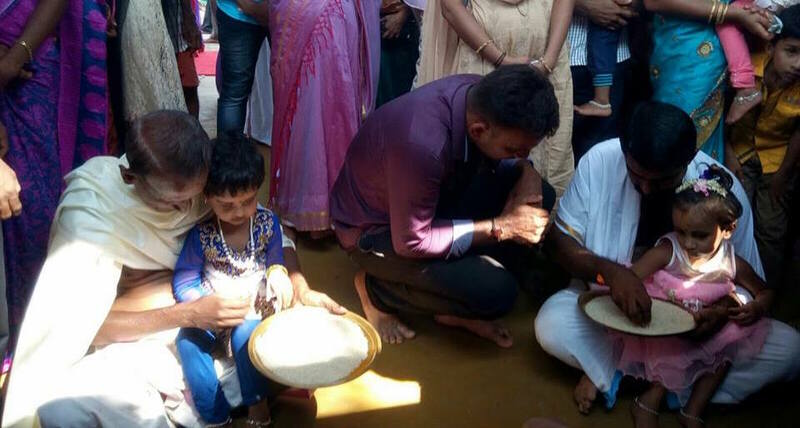 "Vidhyarambham", ceremony for the children before they start formal school education, "Annaprashana", an infant's first intake of food other than milk is also carried out on the same day. This important festival begins on the Sankramana of Vrischika masa. People from all regions gather together on this day. 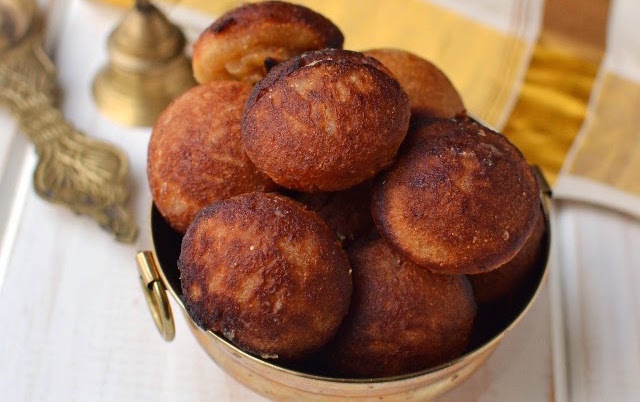 Community members who observe austerities for specified day will prepare "Appam". Appam is prepared for every festival except Kootam, but in this festival devotees are allowed to offer "Appam" to god as a votive offering. Night Udayasthamana Pooja is performed. Next day Bhandaram is brought from the Ananathpura and at night "Kulichu nikkal" is experienced. Appa prasadam is distributed to the gathering. Temple makes sure that each and every family from the community receives the prasadam. Next day "Pandala Mangalam" and Community marriage takes place. Poorakkali is a traditional dance ritual performed by men during the nine-day Pooram festival in Bhagavathi temples. The Pooram festival begins with the Karthika asterism and concludes with the Pooram asterism of the month of Meenamasa according to the Malayalam calendar to honour Kamadeva, the god of love. The Poorakkali dance itself is performed by a troop of young men decked in lion costumes around a huge, multi-tiered, lit lamp, also known as a "Nilavilukku." The dance involves masculine movements and acrobatic, martial art steps. No singers or musicians accompany the dance; instead, the dancers themselves keep rhythm by singing, clapping and executing synchronised foot-thumping movements. The dancers usually observe a month of abstinence and undergo strenuous practice before the performance. Most of the songs sung are hymns from The Ramayana or The Bhagavata. Pooram Kali in Perne has got it's own uniqueness in rituals and celebration. It is celebrated in Mina Masa. People from the community gather in Perne six days ahead (Pushya nakshatra) of full moon day. Bandara is brought on the day, booth (Chappara) is put up. For five days, the custom of "Hu hakuvudu" takes place. This custom is done by Naltyar of Shrine, and the rituals vary in its style each day. Every day during this festival rituals and poojas are offered to the God. Last day Acchanmar Kulichu Nikkel, Darshana is witenessed. All these celebrations put together is called "Poorostavam". On this occasion "Pooram kali" is done in Kavu. Vaniyar's doesn't play it, it's generally done by Yadava's or Maniyani's from Mulleria, Karadka area. They come to Perne on the second day and they play Pooram Kali for about two hours. They stand in a circle in front of Bhagavathi Devi shrine with a big lamp (Deepa) in the middle. To begin with Ganapthi shotra is sung, followed by song stories of various gods. On the last day, Pooram kali starts in the morning and ends with Kulichu Nikkel. In the end, they take revolutions around the temple to seek blessings of devi along with Darshana people. "Kannagat Bhagavathi" is goddess of Yadavas and she shares the same shrine with Muchilot Bhavagathi. This could be the reason for celebrating Pooram Kali in Perne. This is the last festival in Perne. It is celebrated on 18th day of Mesha month. Devotees bring Balivadu. Bhandara is brought from the Ananthapura, followed by Kulich Nikkal of Acchanmar. Shree Vishnumorthi Daiva's darshana team perform activities to send out the evil forces from the surroundings of the temple. Next day cleaning of Kshetram is done by tanri. Guliga nema is also performed on the same day. Bhandara is sent back to Ananthapura and temple door is closed (Nada adakal). Next festival is celebrated in Simha masam. Kaliyatam (Perum Kaliyattam) is the most important festival in Perne. It’s a seven-day celebration. It’s carried out once in twelve to fifteen years if a financial condition is stable. The dance or invocation is performed in front of shrine for almost every deity of the shrine continuously for seven-day, last being that of the Devi Bhagavathi. Kaliyatam is a culture in itself and "theyyam" is a treat to watch. Lakhs of devotees converge here during the occasion and food is served to all every day. Jati Kuri is an offering performed at every household of ganiga/vaniya community. For easier administration, the community is divided into five divisions namely Iyyayirabattam, Moovariyabattam, Vitla seeme, Elu seeme, Sullia seeme. In every division, once in a month or two pooja is carried out. People have to register to carry out this Pooja in advance (Kuri Panam). The house to carry out Pooja is chosen from the list of registered houses sequentially. Relatives and administrative people of particular division gather and perfom the pooja. Pooja is offered to the god though banana and few set of customs are carried out. In the end, prasadam (Banana) and food is served to the gathering. This Pooja is not just of religious significance but that of social significance as well. It has connected people.